Political, absurd, and darkly hilarious, the Folk Lordz digital sketch series is a bold new addition to the Canadian comedy landscape. Reflecting urban-Indigenous, immigrant, and activist perspectives through the lens of biting satire, the 15-part series doesn't shy away from having a big, dumb laugh in the face of society's ills. For full cast and crew click here. - Second place winners, 2017 Comedy Shorts competition for 'The Statue'. - Official Selection for 'Mandatory Curriculum'. Check out the YouTube channel to see all of season 1, plus bonus sketches! The Folk Lordz live improv show consists of a fusion of folk storytelling, long-form improvisation and physical comedy. Taking inspiration from Indigenous oral tradition and storytelling practice, Russian Chekhovian character drama, and a third genre of the audience's choosing, Folk Lordz craft a spontaneous and hilarious homage to cultural storytelling practice. This work has won them two cultural diversity in the arts awards from the Edmonton Arts Council, and the show has toured internationally to Philadelphia's DuoFest, Atlanta's High Wire Comedy Fest, Austin's Improvised Play Festival, Vancouver's Chutzpah! Festival, Toronto's Bad Dog Theatre Combustion Festival, Vancouver International Improv Festival, Edmonton's LitFest, Edmonton's Thousand Faces Festival of Mythic Art, and the Toronto, Edmonton and Winnipeg Fringe Festivals, and headlined numerous CHiMPROV shows at Rapid Fire Theatre. As part of the further development of this project Folk Lordz travelled to Yellowknife, NWT to learn traditional oral storytelling practice, protocol and structure from Dene elders. This research trip was supported by the Edmonton Arts Council through the Cultural Diversity in the Arts program. The motivation for this work was further de-colonizing of their performances, broadening their scope from just Cree stories to other Indigenous traditions, and traveling to less urban places and engaging in activities that many stories are about (fishing, trapping, being on the land, enduring cold, etc). Alt.Theatre journal commissioned Folk Lordz to write an article about their experiences on this journey, which was published internationally in the 'Storytelling Across Generations' issue, January 2016. "Todd Houseman and Ben Gorodetsky are doing something special with improv: they’re sharing their heritage through comedy. In Folk Lordz, the two improv-experts take suggestions from the audience and use them to create a long-form piece that’s an homage to the various storytelling styles that make up their respective cultural backgrounds. It links their art form of choice to those of their ancestors. On Friday night, we saw a Cree-Blackfoot war story and a Jewish fools tale. It was educational, funny, smart, and — something that’s atypical in improv — it tugged, just a little, at the heartstrings." Based on the research and development work Folk Lordz have done around Indigenous oral tradition, Ben and Todd Houseman created the Oral Tradition & Improvisation workshop. An exploration of how traditional storytelling could be used both as a style and a tool in improv, using narratives of geography and stories that come from the land, origin stories, trickster narratives and many other styles that are unique to Indigenous oral tradition. Additionally, the class served as a cultural exchange opportunity for participants. This workshop has been taught in Edmonton, Austin, Toronto, Vancouver, and was expanded into the multi-day Decolonization Through Improvisation workshop, which was done as a residency at St. George's School in Vancouver. "Ben and Todd offered a phenomenal workshop in my class, that personalized the curriculum and allowed for candid and non-judgemental dialogue amongst the students. Their passion for the subject matter and genuine approach with the students made for a deeply impactful and fun day. I would have them back in a heartbeat." Folk Lordz was created by Todd Houseman and Ben Gorodetsky in 2014, while they were both senior players at Rapid Fire Theatre in Edmonton, Alberta. The performance and creative duo was born out of a shared love of physical comedy, folk storytelling, and political grit. 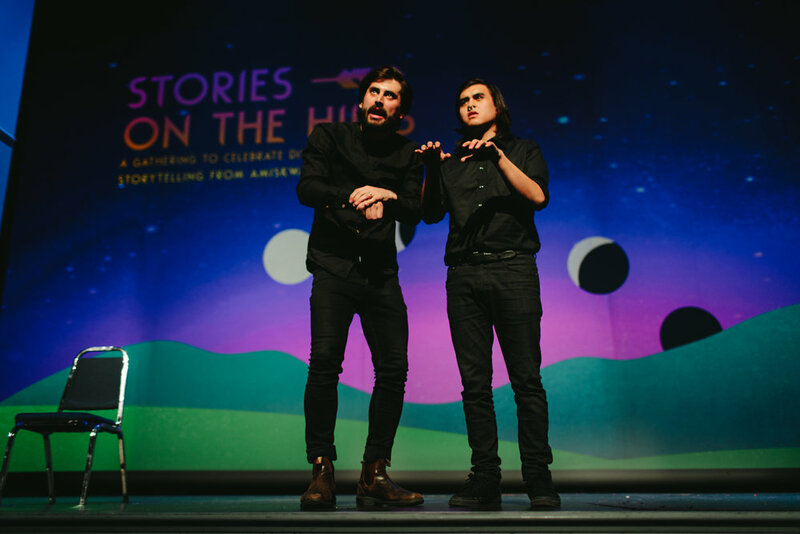 Since then, Todd and Ben have toured internationally, created two award-winning improvised plays, wrote, produced and starred in a 15-sketch digital series, facilitated workshops and intercultural exchanges, and produced the three-day storytelling festival Stories on the Hills. Read a full profile of Folk Lordz and their diverse projects here. Todd Houseman is an improviser, actor, Indigenous activist, author, educator and musician based in Montreal. He is currently pursuing actor's training at the National Theatre School of Canada in Montreal. In his hometown of Edmonton, Alberta Todd was a senior improviser with Rapid Fire Theatre 2009-2017. Todd’s recent acting credits include the new APTN sitcom "Delmer and Marta", Studio Theatre's play "Or the Whale", and Fringe Theatre Adventure's "Metis Mutt". His comic "Ayannisach" was featured in the 2015 School Library Journal Book of the Year award winning Moonshot: The Indigenous Comic Collection. In the realm of education Todd worked as a cultural exchange facilitator and mentor for Indigenous and at-risk youth through Boyle Street Education Centre and the Journeys program. Ben Gorodetsky is a comedian, improviser, physical theatre performer, and storyteller based in NYC. Ben is the former Associate Artistic Director of Canadian Comedy Award winners Rapid Fire Theatre. For three years Ben was the host and curator of Mile Zero Dance's experimental variety show The Dirt Buffet Cabaret, showcasing the best dance, music, comedy, burlesque, poetry, and more from across Canada. Ben's plays (Boogie Monster Club, 7 Steps to Success, and Magnetmonton) and multimedia performances (Charred and Ding-Dong Daddy) have been professionally produced across Canada. Recent acting credits include Anxiety (Theatre Yes), Code Word: Time (Roxy Performance Series), and directing credits include One of Us Must Know (Expanse Movement Arts Festival). Ben holds a BFA in Acting from the University of Alberta, and is currently pursuing an MFA in Performance and Interactive Media Arts at Brooklyn College.